Scott M. Graffius regularly speaks at conferences and other events in the United States and internationally where he delights audiences with presentations on agile, traditional, and hybrid project, program, portfolio, and PMO management. He integrates content on professional standards, best practices, and his first-hand experience with successful implementations. Scott uses everyday language and custom vibrant visuals to make complex topics clear and understandable, and he provides audiences with practical information they can use. Attendees have said “Scott is an amazing speaker,” “fantastic presentation,” and “highly recommended!” For details on his past and upcoming speaking engagements, click on the links below or scroll down the page. Scott will be speaking at the Los Angeles chapter of the Project Management Institute on June 2, 2020. This will be Scott’s second talk at the chapter. Additional information will be provided in early 2020. Scott will be speaking at the Project World * Business Analyst World conference in Toronto. He will be presenting best practices on agile project management, including tools and techniques which attendees will be able to immediately apply at work. Scott’s talk will be held on May 28, 2019 at the Metro Toronto Convention Centre in Toronto, Ontario, Canada. 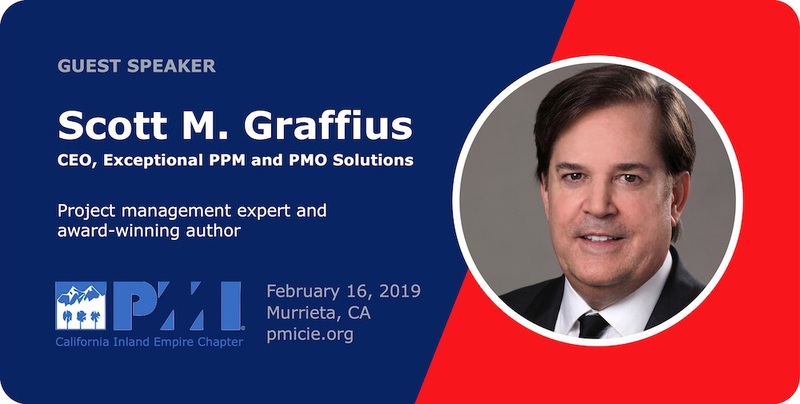 Scott spoke at the California Inland Empire chapter of the Project Management Institute on February 16, 2019. He presented “How to Deliver Your Projects with Faster ROI, Competitive Advantage, and Additional Benefits Using Agile Scrum.” This was Scott’s second talk at the chapter. Scott spoke at the Techstars Startup Week conference, where he presented "Agile Scrum Helps Innovators, Disruptors, and Entrepreneurs Develop and Deliver Products at Astounding Speed Which Drives Competitive Advantage" to an audience of startups and others in the entrepreneurial community on October 4, 2018. Scott presented “Agile Scrum: An Overview (Originally) for The Board of Directors of an Entertainment Company” at an event of the California Central Valley chapter of the Project Management Institute on September 13, 2018. Scott presented “Agile Scrum: An Overview (Originally) for The Board of Directors of an Entertainment Company” at a session of the California Inland Empire chapter of the Project Management Institute on August 14, 2018. Scott delivered a talk—“Agile Scrum: An Overview (Originally) for The Board of Directors of an Entertainment Company”—at an event of the California Central Coast chapter of the Project Management Institute on June 28, 2018. Scott was a guest speaker on agile project management at an event of the Los Angeles chapter of the Project Management Institute on July 25, 2017. Scott led an interactive session on innovation and project management at a private event in London, United Kingdom on February 9, 2017. For more information on Scott’s speaking engagements, please visit SpeakerHub at https://speakerhub.com/speaker/scott-m-graffius.